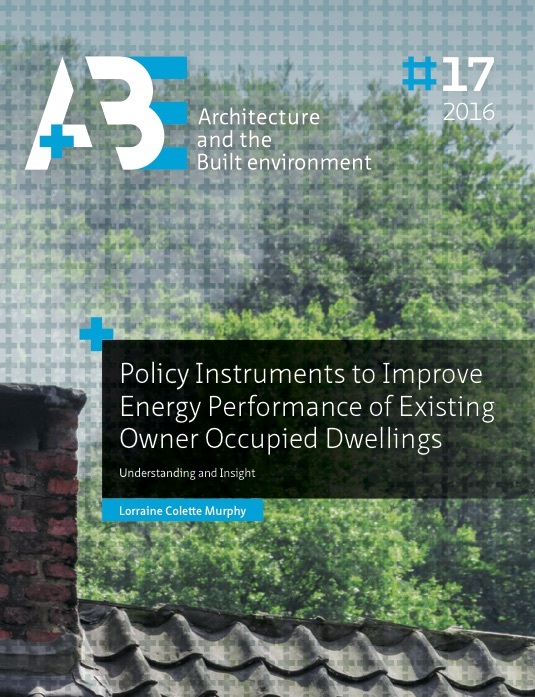 The aim of this thesis is to add knowledge to the role and impact of policy instruments in meeting energy performance ambition in the existing owner occupied housing stock. The focus was instruments available in the Netherlands in 2011 and 2012. These instruments represented the ‘on the ground’ efforts to meet climate change targets and many continue to do so today in the same or slightly altered forms. At international level there is a recognized need to keep global temperatures within the range of 1.5 - 2°C above pre-industrial levels (Carrington, 2016). At European level, the 2020 package contains a series of binding legislation to help the EU meet its more immediate climate and energy targets. 2020 targets include 20% reduction in greenhouse gas emission, 20% of EU energy obtained from renewable sources and 20% improvement in energy efficiency. 2020 targets for the Netherlands are a 20% reduction in greenhouse gas emissions and a 14% increase in energy generation from renewable sources (Vringer et al., 2014). A raft of policies has been produced over the last number of decades from international to local level to orientate action towards targets. At European level the Energy Performance of Buildings Directive (EPBD) drives efforts at reducing energy among one of the biggest players, the building sector. By requiring a mandatory certificate at the point of sale and rent of buildings and making regulatory demands on existing buildings the EPBD upped the ante of what could be expected from the building sector, but especially the existing dwelling stock. It is the above mentioned information deficits that influenced the objectives and structure of this thesis. Instruments are examined from different angles and viewpoints, from experts, owner occupiers, official evaluations and front-runner countries. Assessment frameworks were developed to tease out how well instruments truly function. Households in receipt of instruments such as the EPC and energy audit were compared to households not in receipt of instruments. Moreover, the complete range of national instruments available at the time of the survey were studied to present a complete picture. A more detailed description of the methodologies adopted is presented below. An aim of research was to offer qualified accounts and a deeper analysis of how instruments for energy performance improvement in existing dwellings function. Research components focused on both individual instruments and combinations using a triangulation of methods and sources: expert interviews, a survey and literature review. The first step towards meeting the aim of research was to characterise and assess national instruments in the Netherlands. In the absence of an assessment framework for policy instruments in this domain one was created using elements of the theory based evaluation method and concepts from literature. All national energy performance instruments operating at the time that could influence energy performance improvement for space and water heating in existing dwellings were included in the evaluation. Data was obtained from face to face semi-structured interviews with 19 stakeholders involved in lobbying, designing, implementing and evaluating instruments. Interviewee data was complemented with secondary sources, including; evaluations of the national climate change programme, evaluations of individual instruments, cross country evaluations and European projects in which the Netherlands participated. An online survey of owner-occupiers covering the same instruments as the characterization and assessment of instruments described above was conducted to expand the investigation into instruments. More than 5,000 Dutch owner-occupiers participated in the survey. The survey consisted of 96 questions about energy saving measures adopted within the years preceding the survey. The focus lay on measures that involved significant investment to reduce energy consumed for space and water heating. The questionnaire consisted of multiple choice and open ended questions divided into several categories; the adoption and planned adoption of energy saving measures, energy audits, the EPC, building regulations, the energy tax, financial incentives, information tools and socio-economic and dwelling characteristics. Data on motivations for energy use and perceived influences of instruments was also gathered. The questionnaire was used to meet several objectives. To survey the overall effectiveness of the national instruments available to owner occupiers at that time, to compare owner-occupiers who received an EPC to those who did not along several parameters and to compare owner-occupiers who received an energy audit to those who did not along several parameters. Required sample sizes were calculated on the basis of assumptions and several critical components of the questionnaire that required a set response rate to allow statistical comparison (See Appendix 2). Approximately, 30,000 households from the national EPC/energy audit database were sent a link to the questionnaire. The comparison group was created by sending approximately 16,000 members of the Home Owners Association a link to the questionnaire. Following a reminder, a response rate of 17% was received for the EPC/energy audit database and 10% for the Association of Home Owners database. Both descriptive and statistical analysis was conducted on response data. Descriptive analysis focused on whether householders reported an association between the adoption of energy saving measures and instrument use. Pearson’s chi square tests were used to identify whether an association between adopting measures and instruments could be statistically proven. The final research component consisted of a comparative study of several front-runner countries to gather knowledge and examine the instruments associated with success in meeting climate change targets for existing dwellings. Literature from comparative public policy was used to structure this research component. Denmark, Germany, Sweden and the UK were chosen as front-runner cases. Based on document analysis the instruments considered to dominate action in these front-runner countries were characterised. As with the first research component an evaluation framework was developed and the main instruments were assessed against concepts drawn from literature. Using concepts from literature was an effort to go beyond traditional ‘strength and weakness’ based evaluations by searching for how instruments tackle, or fail to tackle, salient issues in this policy domain. Therefore, ‘effectiveness’ of instruments was interpreted as both the documented results of goal achievement and the extent to which instruments deal with aspects unique to this policy domain. Results from document analysis and instrument assessments based on concepts were verified in phone interviews with national experts. Disassociated from an end point of energy use reduction. Some ingredients for a successful strategy for existing dwellings were however present. The Meer met Minder subsidy was the only performance based subsidy in place at the time of research and was associated with positive results. With subsidy amounts linked to rating changes in the EPC/energy audit it also demonstrates a successful coupling of instruments. Furthermore, interviewees, though regretful of how the EPC had been progressing, remained hopeful for a better future for this instrument with scope for different manipulations for example, with links to property taxes.